Confession: Rock music is not my thing, so perhaps I’m the only person on the planet who didn’t know who Freddie Mercury or Queen was — until now — and Rami Malek’s magnificent performance blew me away. Named after Queen’s innovative, six-minute, genre-melding musical masterpiece, this film chronicles the rise-and-fall of the band’s flamboyant, yet enigmatic frontman. In 1970, young Farrokh Bulsara was a baggage-handler at Heathrow Airport whose conservative, working-class, Indian Parsi family fled from war-torn Zanzibar to Middlesex, London. Born with four extra incisors, leading to an obvious overbite, Freddie brazenly told his future bandmates, “More space in my mouth means more range.” Since they needed a lead singer, he was immediately accepted by guitarist Brian May (Gwilym Lee) and drummer Roger Taylor (Ben Hardy) later joined by bassist John Deacon (Joe Mazzello). 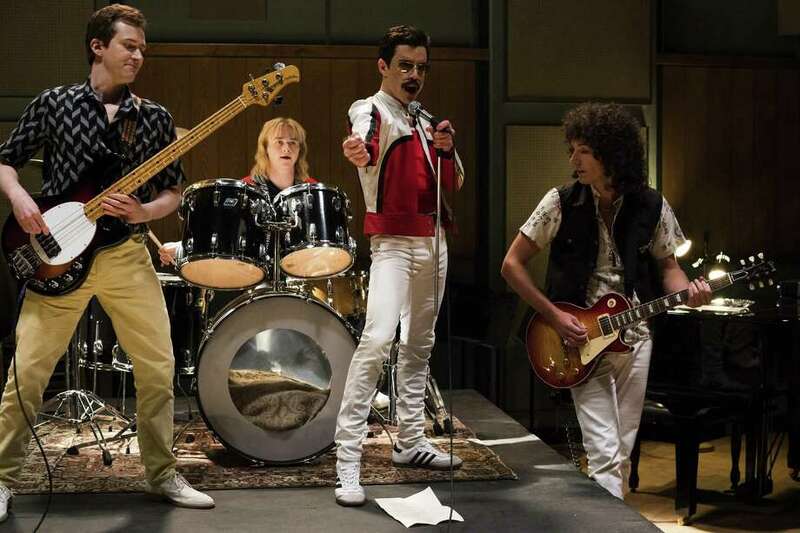 Eagerness for audience participation led to their anthem “We Will Rock You,” along with “Killer Queen,” then “Love of My Life,” which was poignantly tied to Freddie’s long-term fiancee Mary Austin (Lucy Boynton). But his anguished relationship with conniving manager/lover Paul Prenter (Allen Leech) led to continual conflict, since droll Freddie carefully closeted his hedonistic bi-sexuality which, eventually, led to his death from AIDS-related pneumonia in 1991. The awkward direction is attributed to Bryan Singer, who was fired during production and replaced by Dexter Fletcher, now credited as executive producer. What’s most memorable is the meticulous portrayal by Malek (“Mr. Robot”) which transcends the film’s faults. Donning prosthetic teeth and shimmering silver jumpsuit, Malek energetically mimics Freddie Mercury’s strutting bravado. During filming, Malek sang along with Mercury’s recordings and Canadian sound-alike Marc Martel, so the enhanced lip-synching matches up perfectly. On the Granger Movie Gauge of 1 to 10, “Bohemian Rhapsody” is a sinuous 7 - with Rami Malek high on the list for an Oscar nomination.